IMCDb.org: 1994 GMC Suburban in "NCIS, 2003-2019"
Isn´t it to short to be a Suburban? it looks like the door is fully in front of the rear wheel, which would make suburban correct. odd angle, and the wheel well flares make it more odd, but i'd say suburban... i saw the episode, and don't recall "calling them on it" at the time. 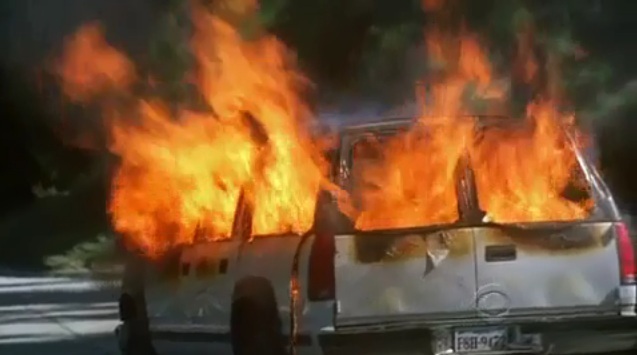 if they had described a suburban and used a tahoe in the footage, i'd have noticed at the time i suspect. yes earlier in the episode the front of the vehicle is seen in security camera footage from a bank and the GMC grille is seen clearly, and they do actually call it a Suburban when they put a "BOLO" on it. so we should make it a GMC..?